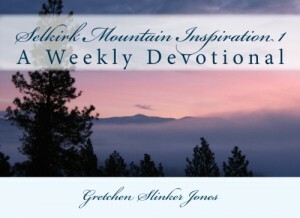 Selkirk Mountain Inspiration 1 is the first of what will hopefully be many volumes of weekly devotional blessings created by pairing original photoart with appropriate Scripture and the author’s thoughts on both the photo and the verse. This book is more than a devotional text – it is a collection of incredible photo art works. All of the photos are original, copyrighted work of the author and her husband. Although some were taken in other parts of the country, the majority of these beautiful portraits of God’s creation were taken in the southern foothills of the magnificent Selkirk Mountain Range in NE Washington state. Each of the 52 pairs of weekly pages, beginning with John 3:16 and ending with the Christmas story from Luke and Matthew, is intended to either start or finish your week with encouragement, inspiration, and a blessing from God’s awesome and marvelous creation for a full year. The bonus photo section in this volume is titled Oh Deer! Selkirk Mountain Inspiration 1 is a revised release of the original Selkirk Mountain Inspiration, published in April 2009.